Located near the intersection of N 75th Ave and W Cactus Rd, Extra Space Storage serves residents of Peoria, Sun City, and Glendale. Locals will recognize our facility behind Little Caesar's Pizza and Lee Lee International Supermarkets south of CVS. 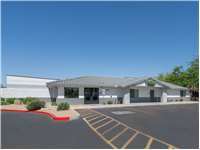 Are you a college student looking for self storage close to Arizona State University West Campus? Extra Space Storage is about 4 miles from ASU's campus in Glendale, so we're a convenient option for storage over the summer or while studying abroad. Extra Space Storage on N 75th Ave offers a large selection of storage units, climate-controlled storage, drive-up access, and more. We're your go-to storage solution in Peoria! With units ranging in size from 5x5 to 20x25, our Peoria storage facility can accommodate items large and small. We also have units with features like indoor access, first-floor access, elevator access, and more! At Extra Space Storage, we're dedicated to the safety of our customers and their belongings. That's why our N 75th Ave storage facility has individually-alarmed units, electronic gate access, an on-site resident manager, and 24-hour video surveillance. When storing temperature-sensitive items in Peoria, we recommend climate-controlled storage. These units stay between 55 and 80° year-round, protecting your items from damage. Climate-controlled units are available in sizes 5x5 to 30x10. With drive-up access, unloading and loading items is easier than ever! Simply pull a vehicle up to your unit to move heavy, large items in and out without hassle! Drive-up units are available in sizes 5x10 to 20x25. Not only does Extra Space Storage maintain a clean, secure facility at all times, but our friendly, professional staff is also available to provide assistance whenever you need it. We're committed to delivering exceptional service and a positive storage rnetal experience. Contact us today to reserve a storage unit in Peoria! Clean. Good times and Service. I've used ExtraSpace Storage two times, once in Boston and once in Phoenix. Both experiences have been very positive! The staff at each location helped me select the right unit and helped with picking up some supplies. Both locations were secure, clean and easy for me to use. It is very clean, alarms on the doors for security, easy to get in and out. Customer service was great. Terrible corporate ran company raise the rates every 6mths will not give discounts to long time clients, been there 5 yrs raise my rate over $100 more then it would be if I was a new customer $50 more on my 2nd unit. Will move out as soon as I can. We were able to get in and out of the signup fairly quickly. Extra Space storage units are always clean, priced well for the value and staff is always very professional in every way. I rented a climate controlled unit. It is very clean, lighting is good, it is very cool in the hottest part of the summer and I like the hours. Also, the people in the office are great to work with. I highly recommend Extra Space Storage. I would highly recommend Extra Storage Space on Cactus and 75th Ave. The price is right and both Kim and Stephanie provided first rate customer service. I checked 5 other storage establishments in the area and this one was the best! Staff very concerned with your needs. The unit was perfectly sized for my needs that way I felt like I wasn't having to pay for more than I actually needed. Clean, secure facility, and offering good front office assistance. I am confident my things are safe and will remain in the condition they were when I moved them into storage. Extra space storage unit is a good place to keep your belongings. The prices are good and very good service. I would highly recommend you check out out before any where else . Extra Space Storage is an amazing place to take whatever you may need to store your precious belongings! A very secure , clean and secure place! Excellent customer service! The space that we rented at Extra Storage was clean, a generous size, and we felt very secure leaving our goods. We are very happy that we found their ad. Great staff at location, very secure, don't really have anything bad to say like most!! But I would recommend this location compared to others that I have rented from. App is very cool on phone!! We have nothing but good things to say about this place. The store manager was very friendly, knowledgable and helped us with all our needs.....we even came in just before they were closing. We highly thank them for helping us select our units. Always friendly and helpful, great place to store your stuff, climate controlled in the desert! I really like the security, access is even easy with the security system. i have very good service when in the renting process. very good location. . I went in to rent my storage space and was greeted with a welcome smile. The rep gave me the overview then took me to the space I would be renting. Very nice. We went back to the office and completed the paperwork. During one of my trips to fill the room, I had a question, went back in and was greeted with the same welcoming smile. The facility is always in pristine condition. I would encourage anyone looking to rent a storage facility to go no further than here. Clean safe and secure, a peace of mind for my precious treasures. I have been renting a space for two years now. The grounds are kept extremely clean and the employees that oversee the grounds are very friendly and helpful. This facility is right by where I used to live and have moved a good 30 minutes away. There are other facilities that our closer but I wouldn't move my stuff anywhere else. I would definately recommend this to anyone that needs a place to rent for storage. Was suprised to find my total monthy bill was different from the amount quoted to me earlier on the phone. I did not like to be TOLD that I had to have insurance on the unit before I could rent it. I told her that I had renters insurance for my home and she said that it didn't make a difference. Very unhappy. Will probably finish the month then give notice to leave. On 75th Ave just south of Cactus behind Lee Lee's Asian Marketplace. Drive south on N 75th Ave. Our facility will be on your right after Lee Lee International Supermarket. 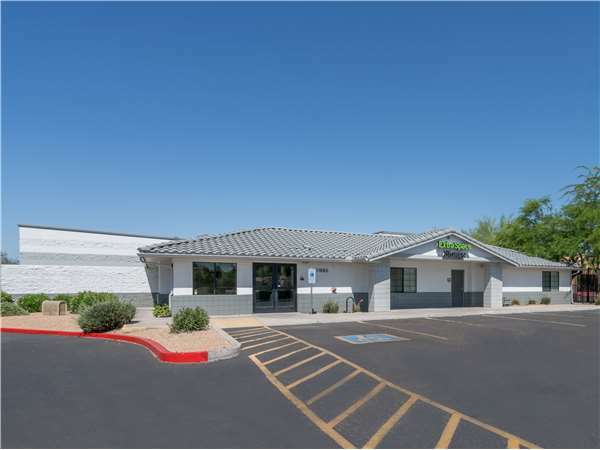 Drive north on N 75th Ave. Our facility will be on your left just after W Sunnyside Dr.
Drive west on W Cactus Rd. Turn left onto N 75th Ave. Our facility will be on your right after Lee Lee International Supermarket. Drive east on W Cactus Rd. Turn right onto N 75th Ave. Our facility will be on your right after Lee Lee International Supermarket.